When we capture students’ imaginations early and often, they are more likely to be excited about STEM as they grow. 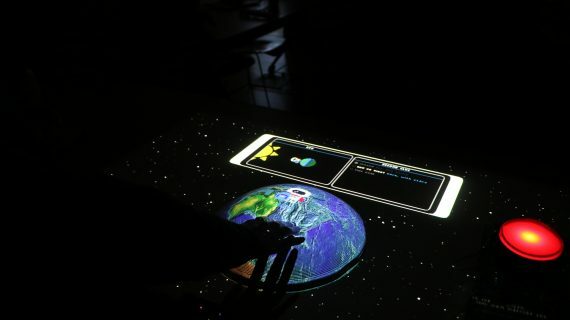 Hubble shakes up the traditional elementary classroom by utilizing projection, motion sensors, and quirky interactive lessons. These lessons create a new way of engaging with science curriculum. Students can tap on the earth and see what time it is in that location. They can move the earth in its orbit and understand how it affects the seasons, spin the earth to see where it is day and where it is night, and see additional layers of information such as timezones. Hubble takes these concepts out of the book and turns the classroom into a shared immersive environment where exploring the galaxy is right at their fingertips. We imagine Hubble to be able to lead students in exploring not only our vast galaxy, but the tiniest atoms in the core of the Earth – all while being as fun to spin as the classic globe.